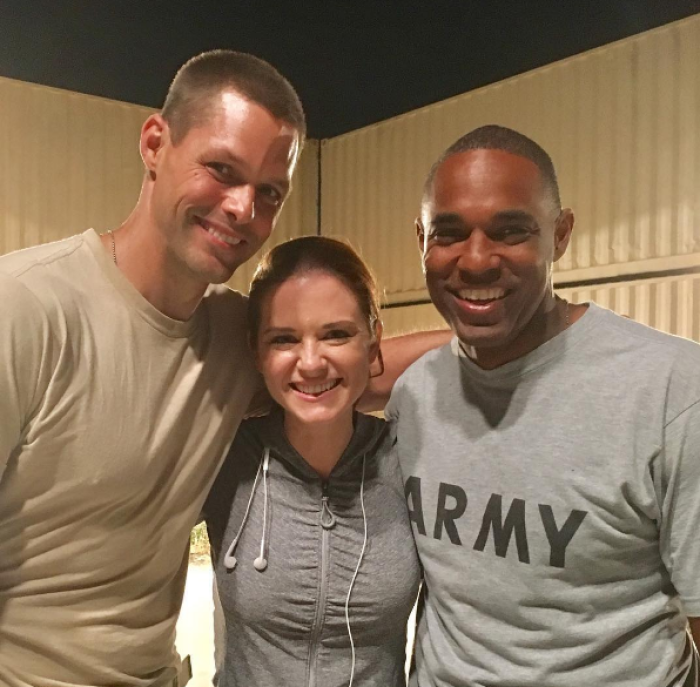 "Grey's Anatomy" stars Sarah Drew, Justin Bruening, and Jason George can be seen together in a movie trailer for the upcoming Christian film "Indivisible," which is based on a true story about the hardships that military families frequently face. "Indivisible" will premiere in theaters nationwide Oct. 26 and tells the inspiring story about families finding the faith and love to fight through hardships that threaten their marriages. The film is based on the life of Army Chaplain Darren Turner, a decorated Iraqi war veteran, who comes home and faces an unexpected emotional struggle that threatens his marriage and the future of his family. "Indivisible" features three "Grey's Anatomy" actors in the leading roles, Sarah Drew who plays Chaplain Turner's wife, Heather Turner, Justin Bruening as the chaplain, and Jason George as a soldier who is having serious marriage trouble, as seen in the trailer. In addition to starring in the faith-based movie, Drew, who is an outspoken Christian and now one of the main characters on the hit TV-series, also serves as executive producer of the film. "The heart of 'Indivisible' is about marriage," Drew said in a statement shared with The Christian Post. "The military is the setting through which we tell a story about what it means to fight hard for the vows you make on that day you stand before God and before your community and say, 'I will love you for better or worse.'" In addition to Drew, Bruening and George ("Grey's Anatomy"), "Indivisible" features Tia Mowry ("Sister, Sister"), Michael O'Neill ("NCIS"), Eric Close ("Without A Trace"), Madeline Carroll ("I Can Only Imagine"), Tanner Stine ("The Thundermans") and Skye P. Marshall ("Black Lightning"). According to the synopsis, "Darren and Heather Turner are ready to follow their calling: serving God, family and country. But when war etches deep battle scars, the Turners' once-solid marriage lies in peril. Shaken and forever changed by what they've experienced, the couple now faces their toughest battle: the fight to save their marriage." David Evans ("The Grace Card"), director of the film, said that he originally set out to do a fictional story about an Army chaplain, but came across Turner's story and believed it was worth sharing. "This true story shows there is no marriage too broken for God," Evans added. "We hope husbands and wives who see the Turners' story on film will stop fighting one another and join forces to fight for their marriages together instead." The Iraq scenes of "Indivisible" were filmed near Santa Clarita, California, north of Los Angeles, at the Middle East Village set on Blue Cloud Movie Ranch. Overall production took 32 days with 22 days in Memphis, Tennessee, and 10 days in California. "Indivisible" was produced by Reserve Entertainment, Provident Films, The WTA Group, Graceworks Pictures and Calvary Pictures, made by the studio that brought "Fireproof" and "War Room." For more information, click here.